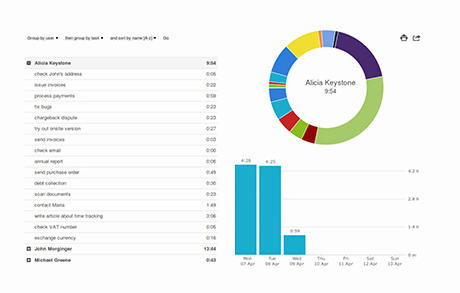 a visual project management tool. Online Kanban board for business with seamless time tracking. Finally. "Kanban Tool has proven itself as a very helpful tool for managing our clients workflows. All employees successfully use it because its simplicity and functionality." "Kanban Tool has worked wonders for our company... overall productivity increased over 50%!" "KanbanTool has revolutionised communication for us. Team members are communicating in real time a lot more; everyone is focusing on bottlenecks; devs are collaborating with testers better." "Definitely the best collaborative visual project management software for Scrum and Kanban I have ever used." "48% improvement in time-to-market and significant increase in software quality - the results speak for themselves." "The good thing about [kanban board] is that I find it really quick to make updates, track progress, see at a glance the status of projects and roadmaps and see really quickly where the issues are." "As a project manager with Kanban software I always know what actually is going on with my project, what problems need to be solved and what my team is working on." Reveal your team's true potential. Let clients and team members collaborate easily in real time by sharing tasks, information and comments, anytime and from anywhere. 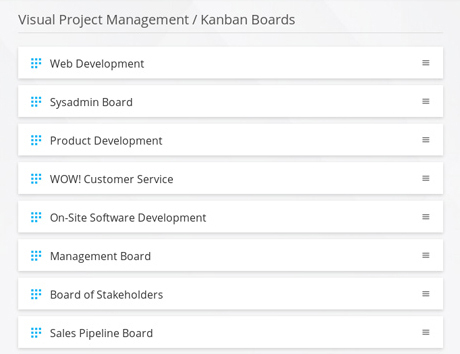 Kanban Tool gives you an incredible clarity and visibility of project's progress. Use Kanban cards, colors, swimlanes, tags and due dates to compose work on Kanban board. Analyze and constantly improve your process to increase business efficiency. Identify and eliminate bottlenecks and problems immediately with Kanban analytics and metrics. Plan, monitor and improve project performance using cumulative flow diagram and cycle time reports. Affordable pricing lets you scale as your business grows. Plans range from free to enterprise level, and everyone will find a good fit. Contact us for a special volume pricing. Get started with FREE trial and test our Kanban software to see whether it suits your needs. Invite as many team members as you like and boost your team's productivity. Discover new level of enterprise collaboration capabilities in one solution. Securely access your vital enterprise data and collaborate anywhere on any device. Host Kanban Tool® On-Site on your own servers and gain complete control over your data. Get in touch and see how we can help your organization deliver exceptional results. Kanban Tool is a visual management application based on Kanban that helps companies visualize workflow, track project progress and analyze and significantly improve business processes. 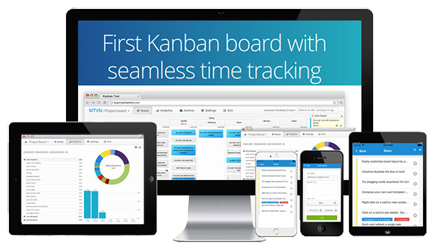 Kanban Tool provides powerful online Kanban boards, insightful Kanban analytics with seamless time tracking. 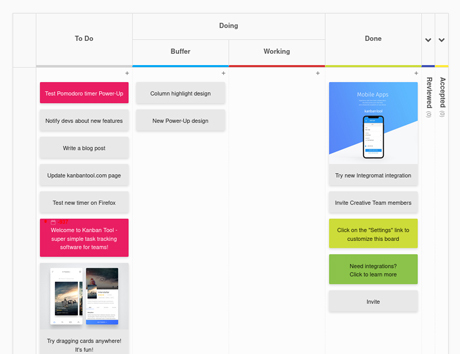 Our Kanban software works perfectly in software development and is designed for Scrum and Kanban teams that want to visualize work on Kanban board.